Sri Lanka is recruiting Tamil police officers from the northern city of Jaffna for the first time in 30 years, defence ministry officials say. More than 6,500 people applied for 500 police constable jobs in Jaffna, a statement on the defence ministry website said. A police spokesman said that applicants were being vetted more strictly than recruits elsewhere in the island. Sri Lanka's military declared victory over Tamil Tiger rebels in May. Although Jaffna has been under army control since 1995, the city bordered the rebel-held areas of Sri Lanka. Between 1992 and 1995 it was under rebel control. Police said that the advertisement for male and female police constables and drivers placed a few days ago had received an enthusiastic response. 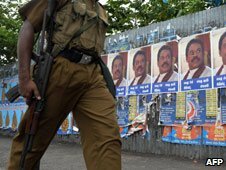 "Since 1979 we have not been able to recruit anyone from the north and east, especially in Jaffna due to LTTE [Liberation Tigers of Tamil Eelam] threats and intimidation," police spokesman Nimal Mediwake told BBC Sinhala's Chandana Keerthi Bandara. "We had somewhere close to 6,000 applications to join the police." . Mr Mediwake said the selection process would take a few days and that young male and female candidates were being thoroughly vetted. "We have to go through their details about their family background." The BBC's Ethirajan Anbarasan says the issue of representation in the security forces has been one of the grievances of the Tamil community. The latest move is an indication the government is trying to address the issue. The rebels considered anyone associated with the security forces as traitors. With the defeat of the Tamil Tigers, many young people are likely to take up these jobs, our correspondent says.